Erected by James Sutherland blacksmith Ulbster in memory of his beloved wife. Janet Manson died 12th March 1874 aged 40. Daughter Jessie died 14th August 1872 aged 5. Elizabeth and Christina died in infancy. 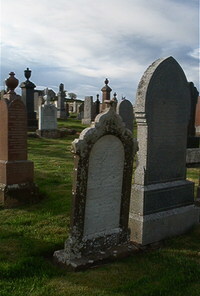 Husband James Sutherland died 4th July 1906 aged 73. Daughter Georgina Sutherland died 28th March 1951 aged 77.